Welcome to the website of Chris Lubbe. Chris is a highly acclaimed inspirational keynote speaker and coach available for education, business, corporate, community clients. Drawing on his incredible story of resistance against ‘apartheid’, Chris keeps his audience spell-bound as he takes them on a journey of discovery. Most importantly his audiences leave inspired to take action & bring about change within their personal lives and respective communities. Growing up in a ghetto in Durban, South Africa & experiencing first hand the brutality of apartheid was a catalyst for preparing Chris for his involvement in the struggle for democracy. His story includes themes such as fear, determination, courage, love and forgiveness, all in the face of blatant racial discrimination. Regardless of where you are, Chris will inspire you to step beyond linitations and to take action. I believe that our children are our future and with this in mind, I undertake speaking engagements & hold workshops at schools, colleges and higher education organizations. Chris is a qualified Performance Coach with a range of multi-sector and ‘people’ skills with experience including; Government, Corporate and Educational sectors. Chris spoke recently at our company leadership event as part of a team of speakers addressing the broad theme of leadership. His focus was Nelson Mandela and talking about South Africa's transition from white minority to black majority rule as well as the circumstances of his own life. Chris speaks about the time through the prism of his role as a bodyguard and therefore closeness to then President Mandela with great passion, humour as well as humility. This was an address given to a mixed group of persons from executive level to junior hi potentials and it held the audience spellbound. The message is personal and the learning experience unique to each individual depending on their experience but is captivating at every level and thoroughly recommended listening. What Chris said will long be reflected on particularly in the circumstances of current world leadership. I invited Chris to speak at the West Sussex Secondary Headteachers' Association Summer Conference last week, following a recommendation from a colleague. For all sorts of reasons, at short notice I had to ask him to change the day and time of his speech and he was charming, accommodating and happy to help. As a result of the changes, he had the final slot on the Friday of a two-day Conference - we joked that it was the graveyard slot! To make it even worse, the speakers in the morning had over-run and so he started late - again, without complaining and with a serene calmness, as if nothing could possibly phase him! He then started to speak - it's a slow burn. He has a gentle, deep and soft voice and uses it to describe incredibly sad and terrible events, moments of hilarity (dancing with Princess Di!! ), moments when history was made and deeply moving personal insights into intolerance, suffering and forgiveness. Gradually, you realise that you are listening to a great man speak about great men and women and great events and that you are unbelievably privileged to be in the same room as him. No-one moved; no-one left early - even when Chris himself over-ran; no-one remained untouched. We Headteachers are a hardened bunch and difficult to impress. He had us in the palm of his hand throughout. I went home and talked to anyone and everyone I could about the transformational impact of Chris Lubbe's presentation. "Awesome!" "Amazing." "Wow!" "Stunning." "Truly inspirational." WOW!!! I have never seen a Guest speaker receive a ovation but Chris Lubbe did so on 2 occasions. He is a fantastic speaker who tells his very moving life story and the issues & history surrounding apartheid with disarming sincerity. Would be good on Cunard too. A captivating and very personable presenter who shares a truly remarkable story with grace and elegance. Chris transports you to one of the most important periods in human history. Attendee of the IBM Sales Event. Goes without saying, he was very moving & inspirational and one could not help but be full of admiration of how he overcame the extreme adversity that is/ was Apartheid. As someone who grew up in Africa, I felt somehow a little closer to his exceptional life experiences. Ubuntu - "I am because of you and you are because of me and together we are"
Chris delivered a lecture here at Warminster School last week to an audience of pupils, parents and staff. It was quite outstanding. It is rare to listen to such an inspiring, moving and powerful presentation and it was quite clear that everyone in attendance was spellbound. Chris is a South African, designated as ‘coloured’ under the Apartheid laws, who became an ANC activist and colleague of both Desmond Tutu and Nelson Mandela. He urged all of us never to turn a blind eye to injustice, prejudice or intolerance but to serve others and to stand up for what we know to be right. He also emphasised the importance of seizing opportunities, resilience, determination and persistence – all qualities that have shaped his life. I hope that Chris will return annually to speak to the pupils here. Chris came to speak at The Romsey School Presentation Evening last night. It was an absolute pleasure to hear his message. He came across as a humble, funny guy who has had an incredible life journey so far. In his message he brings hope for a better future for all our young people encouraging them to make great life choices. Thank you Chris. “Barely a dry eye in the house. Inspirational speaker is a widely used term, in Chris's case it is aptly used. You have to hear it to believe it. "Chris spoke to our senior girls and they were so moved and inspired by his message. He also gave an address to parents in the evening at our awards event and again spoke movingly about his experiences growing up in South Africa. His talks are aimed at encouraging young people to stand up for what they believe in and having the courage to follow their ideals. It was an emotionally charged talk and one that our pupils, parents and staff will remember. Rarely have I witnessed such a reaction to a speaker. Truly amazing." "Thank you for a captivating talk to our students. It was absolutely amazing how your experiences have touched so many of them and how they were still talking about it days after you left. Thank you again for having such a positive impact on our students and I look forward to inviting you to our school again." "This amazing man, held our delegates spellbound at the School Administration Conference. His life story and experiences touched us all. For most of us, at least of my generation, whilst we knew of and deplored apartheid, it didn’t effect us directly. He made it real, both for then and the ramifications continuing into the present day. Thank you for letting us in to your life and sharing your experiences, we can all learn a great deal from you and have taken much food for thought away with us." "WOW! Never before have I seen the pupils and staff so captivated and enthralled. You could hear a pin drop in the school hall! Chris is the type of man you could listen to all day long. His positivity and zest for life is highly admirable and he speaks passionately and honestly. We were honoured to have him visit us and would not hesitate to recommend him to anyone else. Thank you!" "Having had the honour and privilege of working alongside Chris for several years in the UK, I relocated to live and work Moscow, Russia. One of my aims was to introduce the children of The International School of Moscow to this incredible man so his inspirational testimony could be shared with the next generation. Following our current PSHE theme of ‘Freedom and Forgiveness’, Chris engaged and moved approximately 250 children from Year 1 to 7 in his heart melting story via video conferencing, sharing about his mother, the pencil test and his relationship with the late Nelson Mandela. Prior to the assembly, each class had prepared a key question to ask Chris about his life and his experience of living through and coming out of Apartheid. Chris took the trouble of preparing his answers to their questions and invited the children to ask their question during the video conference at the end of his presentation. Any questions that Chris did not have time to answer verbally, he emailed his answer to each class teacher. Chris holds his faith in Jesus Christ highly and shares and lives by these Christian values that Nelson Mandela stood for – a man who truly revealed to the world true freedom and forgiveness! Thank you Chris for sharing this message and positively impacting the lives of the children in Moscow. I hope that one day you visit us in Moscow to meet these children face to face!" "Chris came to talk to our Community of Franciscan Sisters at Ladywell on March 15th of this year. We had over 80 sisters present and a few guests. Chris's own testimony of forgiveness and healing was so moving. It brought tears to our eyes, opened our minds to the possibilities of real love which goes beyond hurt, hatred and fear to a place where peace and compassion for others can enable the human spirit to transcend the worst atrocities of life. Chris by life and example shows us how to live in a way which is wholesome and life-giving. Chris speaks from the heart and is inspiring and what he has to say changes minds and hearts." "Chris gave an inspirational talk at a recent gathering we had for our sisters in England and Scotland. His story touched every heart in the room. Chris's journey to forgiveness demonstrated that forgiveness is indeed possible. We were truly humbled by the manner in which he spoke and he continues to be the subject of many conversations here at Ladywell Convent. "Chris gave an inspirational talk for two engaging hours to our Y11 students. They were completed enthralled throughout his presentation. His discussion of life experiences in South Africa completed engaged pupils regarding discrimination and what can be done to make a difference. A truly motivational presentation. It completely fulfilled my requirements of covering key components of our RE course by looking at forgiveness, discrimination and how individuals can make a difference. 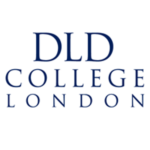 I would highly recommend Chris, your pupils and staff will get so much out of the experience." "Having heard Chris speak at The Anti-Bullying conference in October, I felt so moved and inspired by his presentation that I immediately asked him to visit The Hayling College so that all of our pupils and staff could hear about his amazing experiences. He visited us on Wednesday 11th February, exactly 25 years after Nelson Mandela was released from prison, giving six 1hr long talks to years 6 - 11, parents and staff. There were tears and laughter as we listened and I think it's fair to say every person felt inspired. Below are some of the observations of the day from staff and pupils. Chris Lubbe truly is an inspirational speaker as he recounts his life story to an audience that really doesn’t know what to expect, as anything we know and feel is so far removed from apartheid in South Africa. His message is clear and simple: FORGIVE - that is what makes a difference. He doesn’t advocate violence although it was part of his life; he doesn’t advocate revenge to right the torture he suffered, and neither does he advocate apathy in the face of oppression. What he does proclaim in a soft, mirthful voice is forgiveness in the face of difficulties, prejudice and an intransigent enemy. He was inspired working with Nelson Mandela, and along with his own personal experiences of seeing his Mum manhandled off a whites-only bench and seeing a man thrown off a moving train because he was in the wrong carriage, Chris has forged a path through the morass of inhumanity that still exists in some places today. He has an easy-going manner that makes the message of ‘make a difference’ all the more powerful when he has seen it work, through the emergence of democracy in South Africa. He admits that his homeland still has a way to go but it is heading in the right direction and he has been part of that. He knows how powerful forgiveness can be as he has had to forgive those that would have held him down, permanently. Some people are destined to lead extra-ordinary lives and Chris Lubbe is one of those quiet, self-possessed people who it is a privilege to meet and who you only meet once in a lifetime. I was deeply affected by Chris’s account of his life experiences living with apartheid; it meant so much more than reading a two dimensional account of how it was. How inspiring that he is using his upbringing in such a hugely negative environment to move on with his life in such an amazing way, touching so many lives across the world in the process. I am convinced this is something I will never forget and I am grateful that he touched my life. 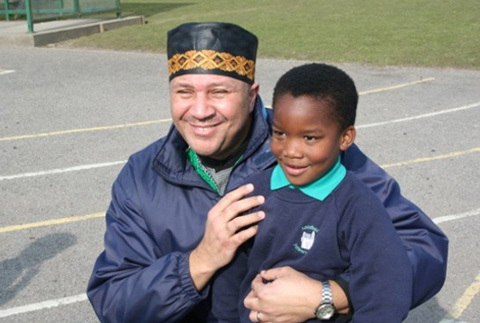 On Wednesday 11th February 2015, year six to eleven had the privilege of meeting Nelson Mandela’s personal body guard, Chris Lubbe. 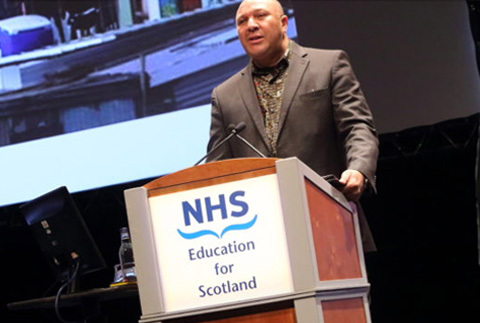 Having been the bodyguard for Nelson Mandela himself, Chris now works for UNICEF and is a motivational speaker for schools in South-Africa and the UK. Chris came to our school to tell us, the story of his childhood and his work for Nelson Mandela. Having Chris perform his motivational speech to our pupils gives the pupils the chance to have an open mind in the past of South-Africa, showing us the un-imaginable challenges he faced fighting for deserved rights. He taught us to appreciate what we have and that anyone can make a change to the world. Thank you Chris, we look forward to you visiting us again." "What an excellent Video Conference! Our Year 6 pupils were captivated for over an hour. They were thoroughly stimulated by Chris's memories and this created great questions for our class topics. Thanks Chris, it was great!" "Chris' talk was without a doubt the highlight of our upper-sixth Current Affairs programme! A truly inspirational man, Chris exudes such a zest for life. Joyful and full of hope, even when recounting the horrific things he experienced, the pupils were desperate to shake the hand of this hero. His story is one which must be told and which must be heard." "Chris' speech was up there with the best I've ever heard. A remarkable man who has led an extraordinary life. As for our KS4 students, they responded to Chris like a hero who had come home! They completely related to his story with a sense of awe and wonder (as well as a few tears) as he continued to reel off his account of South Africa during the Apartheid years. Through Chris' potted and personal history of how South Africa rose to become the Rainbow Nation, his message shone through and our students learned that after all the determination and the courage of standing up for what you believe in, real heroes have to abandon vengeance and embrace forgiveness. A powerful and emotional experience meeting you Mr Lubbe. Thank you so much and please come again each and every year!" "Chris came to talk to us about his experiences and the power to change and we were not disappointed. I have received so many positive comments from colleagues who attended who, like me, were enthralled by Chris’ presentation. He is a great public speaker, captivating the audience, and I have never heard such a long applause at the end of a talk before. His honesty and integrity in telling his story was inspirational in advocating change, working together, determination, courage, forgiveness and moving forwards through difficulties. The energy and buzz created from the talk was humbling and intensely positive." "We had the good fortune of having Chris speak with our students via video conference. Chris truly brought history to life for these students and I'm sure they will never forget it. It was such a powerful learning experience as Chris is a master story teller. His positive outlook despite living through violence and oppression is inspirational." "Mr. Lubbe spoke to two Burnaby schools recently via Video Conference. In both audiences, you could have heard a pin drop - the students were so mesmerized by the stories of apartheid and the artful way in which Mandela's legacy was woven into the presentation. Video Conference is an excellent alternative to live events. Mr. Lubbe was masterful at creating a smooth technical experience, using slides, video and personal interaction to make the experience memorable." "Chris provided an inspirational talk to our customers at a recent seminar. His talk of struggle, overcoming adversary and succeeding in spite of great difficulties resonated with our audience of business professionals. I would thoroughly recommend Chris for a talk at other corporate days. Thank you"
"I can think of no finer way to demonstrate the values of our school and community and how they link to the UN Convention on the Rights of the Child than through Chris's inspirational story. Our staff left the INSET day with an increased and unified sense of purpose and understanding. Staff spoke of their 'inspiration' and how their 'eyes had been opened'." "Chris held the school spellbound during his talk. It was a privilege to meet and listen to someone who was, literally, living history." 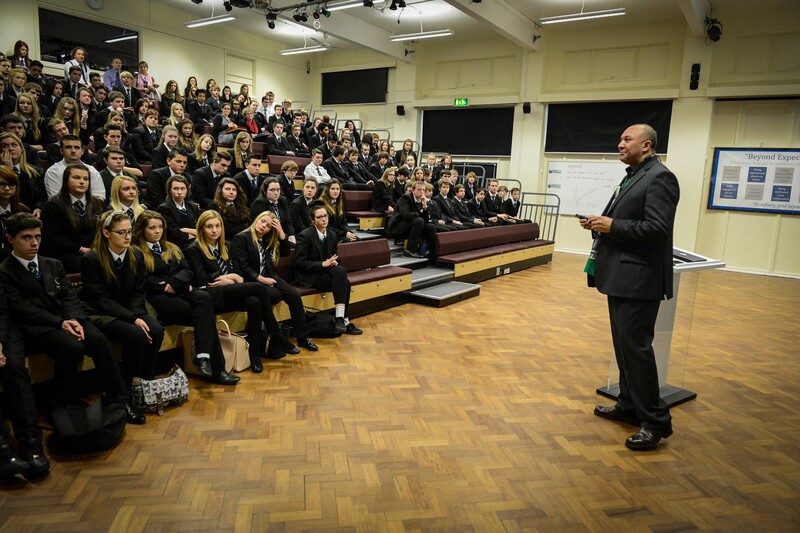 "Chris Lubbe visited Lancing College in June 2013, as part of our celebration of the 100th birthday of a former pupil, Trevor Huddleson, and his contribution to the struggle against Apartheid." "I've had such a powerful and positive reaction to your visit yesterday, both from staff and children, and hope that we were able to give you a brief but meaningful insight into what we are trying to achieve here too." "Thank you so much for coming to the unit yesterday and sharing your inspirational story with everyone." "Thank you for coming to see us. Your talks to the children were inspirational and humbling and you created quite a buzz around the place." "Thank you so much for coming to our school yesterday for black history month and sharing your inspirational story with everyone and taking part in our annual HYBO award and exhibition evening." "You delivered a talk in the school Assembly Hall to the entire cohort of S3 and S4 pupils. You took us through the story of your family, ranging from the days when your great great grandfather was enslaved up to the present day in South Africa. The details of your own personal experience of the apartheid era and your decision to become involved with the African National Congress and their struggle to set the country free from its tyrannical yoke were both shocking and deeply moving. The young people who knew little of these things were captivated by the tales that you told of your own experience of discrimination, violence and torture, while older members of staff were reminded of their own privileged younger lives running parallel with the grim reality of the oppressed majority of southern Africa. You spoke of onlookers who failed to act in the face of sickening violence and linked this to pupils turning a blind eye to acts of bullying. Although you spoke for over 1½ hours, the attention of the pupils was rapt throughout. You spoke of how you came to know and work for Nelson Mandela, and that the most important message the great man had passed on to you was to forgive your former enemies in order to build a better, fairer future for all. This was stirring stuff and entirely in keeping with the Rights Respecting School Agenda that both Lockerbie Primary and Secondary schools aim to promote. You explained to us just how difficult, but ultimately necessary, it had been for you to grasp this lofty concept. Many pupils had questions for you afterwards and you posed for photographs with others, while many more have since tweeted you to say how much your words meant to them, with several saying that it has changed their lives. Its fair to say that your visit has had a great impact on all of those fortunate enough to hear your story and it was both a very humbling, but also inspiring experience that will long live in the collective memory. Many thanks, once again, Chris"
Kayla: Chris was amazing and the time we spent with him was extraordinary. Hayley: Chris is a truly inspirational speaker. Kieran: It was a great opportunity to meet someone like Chris and for him to take the time to come and speak to us. Shaun: Chris told us to remember that “the key to peace is forgiveness” He told us that he learned that from Nelson Mandela. Chris was so inspirational and I will never forget him." "Our Year 10s had been studying Human Rights violations, but knew little about Apartheid and the injustices carried out in South Africa between 1948 and 1998. Chris opened their eyes to how unfair life was for black South Africans just because of the colour of their skin. They found much of it unbelievable. It is important that they learn about these issues to make sure they don't allow it to happen again in their futures. Chris's final message about forgiveness inspired many of them to think hard about their own feelings towards others. Thank you Chris." "Chris has already worked with many of our schools & teachers. They have given overwhelmingly positive feedback about the impact he has had on pupils & the staff. It is the sort of experience that children & young people will never forget. He has the ability to engage a wide age range, from infants to senior students, from inspectors to the most vulnerable of our young people. His journey, his reflections and wisdom, born out of pain & suffereing, is an inspiration to them all." "Chris was the key-note speaker at our Business Breakfast in November. He spoke powerfully to an audience of nearly 60 people about his experiences growing up under apartheid in South Africa & what he ultimately learnt about forgiveness. He also shared some of his experiences of working alongside Nelson Mandela once he became President & witnessing the negotiations that led to the emergence of the 'Rainbow Nation'. Chris was able to combine tales of terrible struggle & suffering with humour & hope, so as to both challenge & inspire us. I would recommend him to your school, church group or organisation as someone with a great story to tell & an important message to deliver." "Chris kicked off our Anti - Bullying week 2013 with an inspirational talk about growing up in South Africa. The children were mesmerised by some of the stories that Chris shared. They struggled to comprehend the widespread violence the nation suffered through apartheid. Chris engaged the children with his fascinating and frightening accounts of life in SouthAfrica. One of our teachers organised a spectacular balloon launch at the end of the week where individuals wrote messages of hope and aspiration against bullying. Chris led this with a few words which inspired our anti- bullying charter. A truly memorable occasion"
"Thank you so much Chris for your inspiring and emotional speech you gave at AIM seminar last weekend. I am ashamed to say I did not know a lot about Apartheid and I was so shocked to hear the pain you and your family experienced. I feel honoured to have heard your story, it will stay with me and remind me to never give up. A true example of being here to make a massive difference." "Chris was wonderfully engaging, passionate and utterly honest about his experience of growing up during the Apartheid years in South Africa. While he was speaking, you could have heard a pin drop, he held everyone's attention for the full time he spoke. He gave everyone through his talk the means to see our individual issues, struggles and problems in proper perspective. While at the same time Chris demonstrated that certain attitudes of mind and personal skills are necessary if we are all to rise above our individual and societal challenges. It is rare for a speaker to take you through the full range of human emotions in a talk from horror and anger to joy and out right laughter. But Chris's gentle and open hearted style mean't that he could speak to such issues in a way that fully engages the audience, whatever their personal knowledge of the time and situations, he was speaking about. He was an inspiration to hear and even if he had been the only speaker on the day, he was way more than worth the ticket price. Over the years I have heard many speakers at conferences from business leaders, sports personalities, top coaches and entrepreneurs, but Chris's talk will stick with me for a long time to come"
"Working for Utility Warehouse requires personal dedication and sometimes a little help from driven and inspiring people helps to create a better mind set for myself in my chosen career. Having heard a number of motivational speakers I would like to commend you Chris for your very moving and extremely inspirational talk. Your story is almost unbelievable and listening to you has and will help me through my intended journey to be successful..... your attitude to life is truly a thought provoking concept that I believe would genuinely help people along their journey's in life. A humble story! Anyone thinking of seeing Chris I would highly recommend it"
"All we can say is WOW! What a truly inspirational man with so many experiences to share and wise words to impart. The suffering you had to endure during the apartheid has made us realise how lucky we are to have the freedom we do today. We can not even imagine how it must have felt to witness some of the terrible acts of unkindness you have - some of which happened when you were only the same age as us. A big thank you for your time and patience with us - we will never forget this day"
"I had the privilege of listening to Chris' story at our recent Heads and Deputies conference. His story is both inspirational and shocking and there is so much that we, as Headteachers, should learn from what he says. Not least, he reminds us of the role we play in ensuring that the children in our schools learn the skills they need to challenge injustice in the world wherever they see it. In the words of Nelson Mandela - 'Education is the most powerful weapon that you can use to change the world"
"Chris was inspirational! His journey and the lessons that he imparted from it had a real effect on everyone in the group. We were all totally absorbed by it. There is so much that we can all learn and then put into practice from what he has to say." "Chris came to Crofton School and delivered 5 x 1 hour talks and an assembly all in one day; a marathon by anyone's standards. All day he was dynamic and engaging. Everyone who listened to him were instantly touched by his words. He told his story about his childhood and how he was treated just because of the colour of his skin. He also spoke about his work with Nelson Mandella. Chris's enthusiasm, passion and dedication was an inspiration to all of us; he was motivating and encouraging young people to make difference too. It was one of those days we will remember for a long time and one of those days that has made a difference to how we regard our very important role in the global community. We hope to invite Chris back to continue to work in more depth with our students"
"We had the pleasure of welcoming Chris for a day at Bitterne Park School to deliver a set of assemblies to whole year groups and in addition a number of targeted student groups. The response from our students towards the content and delivery of each of these assemblies has been amazing. You could hear a pin drop as Chris shared his stories growing up through the Apartheid period and then working alongside Nelson Mandela. The content of each assembly was adjusted to suit each audience (Yr 7 - 13) with more opportunities to ask questions for the older students. As always in schools, time is precious and I wish we could have found more time for each group to listen more to Chris. Some student comments: Thank you for sharing your inspirational words and moving stories. I now have a greater awareness of what happened in South Africa during Apartheid. (Macy Yr 8) I learnt that I should forgive. Thank you for sharing your amazing story (Dan Yr 8) Our students have fully engaged with Chris and large numbers have accessed on the twitter feed. Everyone is asking when Chris can come back Many thanks, kind regards"
"The children and staff were in awe of Chris and were inspired by the stories he told and the messages he gave. We are waiting with great anticipation for his children's book to be released! An inspirational speaker, I hope we will have the great pleasure, and honour, of his company once again some day." "Very rarely have I seen a room full of children so captivated than at the Anti Bullying conference today. Slightly star struck myself! Inspirational. In his first visit to the United States and Burlington County, NJ during New Jersey’s Week of Respect this past October 2017, Chris Lubbe addressed students, staff and parents in the Burlington County Institute of Technology and Burlington County Special Services School Districts and other districts in Burlington County. Chris’ message of hope, tolerance, trust, forgiveness, perseverance and humility resonated with students with special needs, students enrolled in career and technical education programs to parents and community members. In all cases, and unprovoked, after each of his interactive question and answer periods, Chris Lubbe received a standing ovation. His message had an immediate impact. Participant attitudes and sensitivity to the human condition changed as a result of hearing about his life’s journey. Students and staff alike commented that if Mr. Lubbe can forgive his torturers and befriend them, the they could forgive those who hurt them in some way. In fact, one student asked how he can be more like Nelson Mandela and Mr. Lubbe. Wow! As a result of Chris’ visit to Burlington County, he is now a speaker in demand. We hope to see him again next year.